Three months have elapsed since the Japanese threefold disaster occurred on 11 March 2011, and the survivors in Tohoku have now accepted the reality of this apocalyptic disaster even as its overall costs are gradually being revealed: costs to rebuild the tsunami-hit towns, lost businesses and jobs, compensation to those evacuated as a result of the Fukushima nuclear crisis, and the reality of 24,000 people dead or unaccounted for. However, global attention to the disaster is vanishing rapidly. Guess what figure 1 depicts? The vertical axis is expressed in a logarithmic scale and so the curve is falling very quickly soon after 11 March, indicating a precipitous decline. Students of physics may surmise that the curves are the decay of radioactive substances emitting from the Fukushima Nuclear Plant. However, that is not the case (the radioactivity is shown in figure 2). What figure 1 actually expresses is the daily count of those Twitter tweets concerning the Japan disaster. We searched Twitter tweets written in English using the Boolean search ((earthquake OR tsunami OR nuclear) AND Japan) and counted the number of daily tweets with the expectation that these would reflect the degree of global attention to the disaster (Fig 1). The curve resembles that of radioactive decay (i.e. exponential decay), declining rapidly but with a decreasing rate of decline and tempered somewhat by subsequent (media coverage of) aftershocks and other related events. 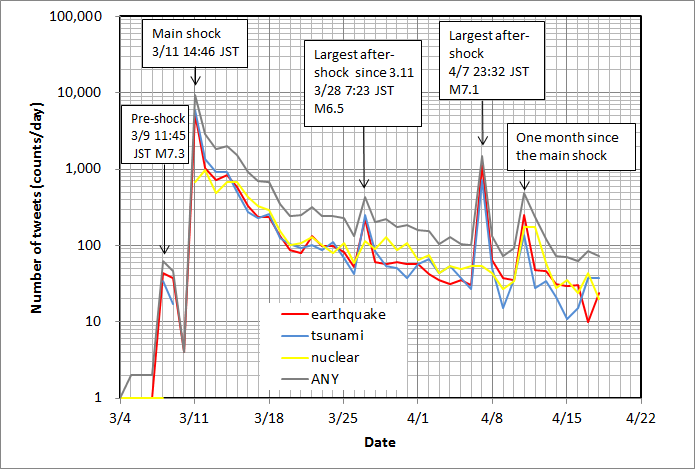 We fitted exponential curves to daily tweet counts for the period 11 March to 6 April (the day before the then largest aftershock) to obtain an estimate of the half-life of global attention. 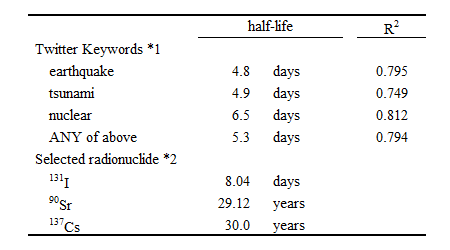 The result is shown in table 1 with half-life of major radionuclide generated in nuclear fission also shown for comparison. The half-life, the period in which the frequency is reduced to a half, is about five days for the earthquake and tsunami in Japan, and six-and-a-half days for the nuclear crisis. The speed of oblivion is much faster than the decay of life-threatening radioactive substances. The purpose of this article is not to grumble at the global public for their posthaste amnesia, but to revive mindfulness of age-old Japanese counsel: "a disaster strikes when it is forgotten". The proverb articulates three messages: an unimaginably long recurrence period, a hazard may become a disaster if people are not prepared for it, and we forget. Rebuilding of the cities and the economy, and review of energy policy must take all these into account. Whether we can beat the saying or we have to live with it, we do not know. Apocalyptic disasters rarely take place in one's own lifetime, but if we look back, such events are occurring with surprising frequency around the globe; be it the 2004 Indian Ocean earthquake and tsunami that killed 230,000 people, the 2008 Sichuan earthquake that killed 69,000 people, or the 2010 Haiti earthquake that killed some 200,000 people, and perhaps other not so well known events, all of which killed more people than the 2011 East Japan Earthquake and all of which have occurred in this millennium. Bearing witness to and communicating news of terrible experiences from rare events across geographies is one ways to beat the old saying, and that is what this Bulletin is trying to do. 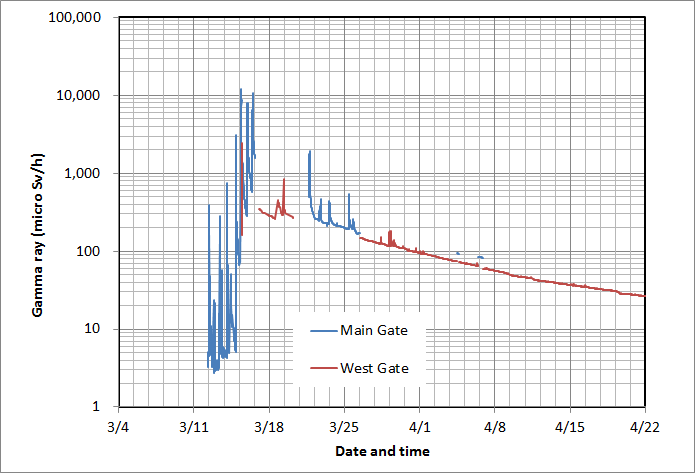 - Radmonitor311 (2011) "A summary page of radiation monitoring data and graphs related to the nuclear power plant accident in Fukushima, Japan" URL: http://sites.google.com/site/radmonitor311/top_english, retrieved 21 May 2011.